When I was a lad, the Seattle Mariners and Mother's Cookies teamed up to create several years of team sets, many of which still reside in my collection. Attendees received a small envelope of cards as they entered the Kingdome on scheduled "baseball card day" games throughout the season, or you could buy sets and albums in the stadium shop. I never felt flush enough for the full set, so did my best to trade for missing cards. Jim Beattie generated Seattle's most interesting pose, given that he was a pitcher. 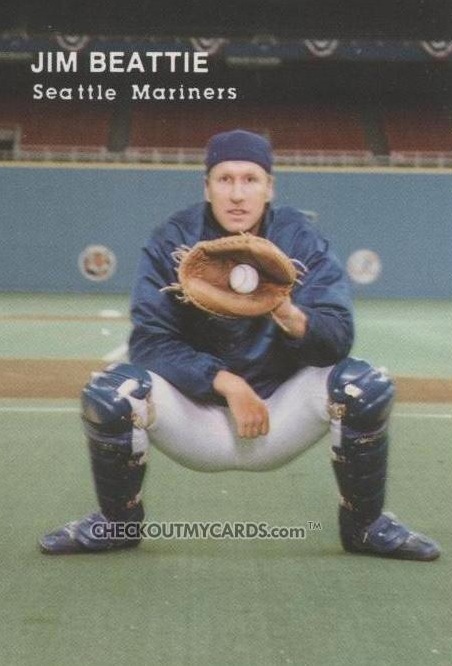 Not sure if this a straight-up photo gag or they caught him in bullpen warm-up gear. Several other cities got the Mother's Cookies treatment in that era--any favorite cards from other collectors? 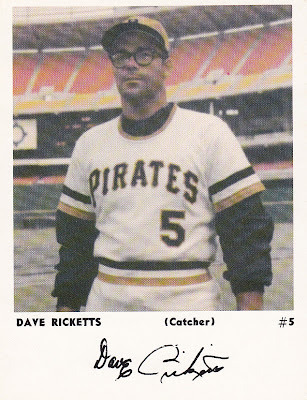 On the same theme but a generation prior, Pittsburgh sold sets of pre-autographed photo cards to fans throughout the 1960s and 1970s. Today's featured players wearing white 1970 home duds in an empty Three Rivers Stadium, which opened on July 16 of that year. Its 25-man checklist includes HOFers Stargell, Mazeroski, and Clemente, making set-building a challenge. I learned this 1970 Pittsburgh uniform, the "white home alternate," was MLB's first entirely synthetic model, down to its stretchy waistband and pullover jersey with no zippers or buttons. That means the synthetic jersey's middle aged! Next thing you know, it'll be riding around town in a new "mid-life crisis Corvette" and shooing teenagers off its Astroturf lawn. Value: This #5 came in a group lot for $4; they're rare enough to make singles unpredictable. You might get lucky, like I did, and find for $1. HOFs run $25 or more. Fakes / reprints: Haven't seen any in the marketplace, but it'd be easy to fake valuable players like Clemente. Note these are oversized cards, approx 3.5" x 4.5", so larger than a normal card but smaller than a postcard.